Last week was all about going local, and the week of January 22-28 is about mailing internationally. My career has given me the opportunity to travel to a few other countries over the years, and my winning personality (*cough*) has allowed me to make friends located around the world. 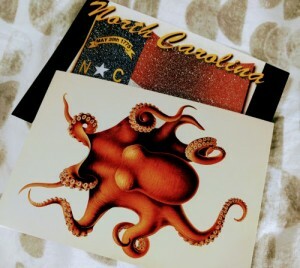 Thus, I’m fortunate enough to have pen pals around the globe. Still, last week I was excited to learn about Postcrossing, which helps people send and receive postcards from around the world. I signed up immediately and have already mailed postcards to strangers in Germany and Russia. The service is free and easy to use, so I encourage you to check it out. Apparently a friend of mine already has photo albums full of cards she’s received from around the world via Postcrossing, which made me incredibly jealous and now I am 100% challenge accepted. Me: I signed up to get a random pen pal in another part of the world. Rebecca: Will they be in prison? I always wanted a prison pen pal. To my knowledge, this isn’t a prison pen pal program, so if that’s what floats your boat, you’ll have to do an online search to find a different site to set you up with a convict. I keep a few sheets of global postage on hand, and the convenient thing about them is that the same stamps work for postcards or letters in envelopes. If you need to make a special trip to the post office to get global stamps, you might want to see what other stamps they have right now. 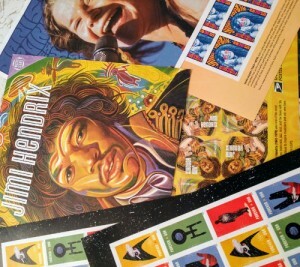 For example, I was thrilled to find a stash of Star Trek, Janis Joplin, and Jimi Hendrix USA 1st class stamps this week, and I stocked up.